Greedy Eater: Alert — Delcious Potatoes Found at Waitrose! Alert — Delcious Potatoes Found at Waitrose! 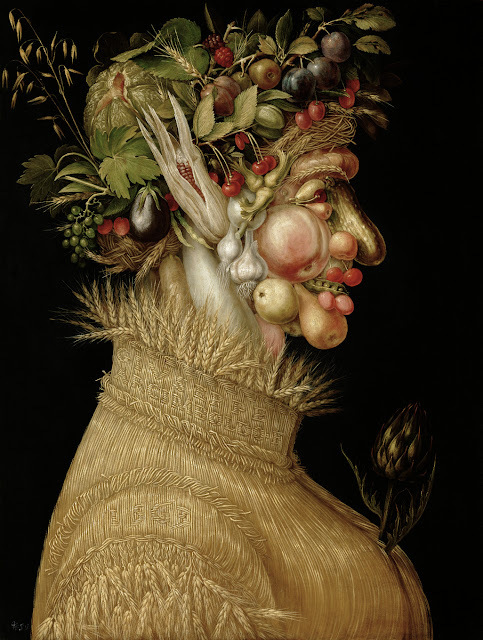 I invariably eat organically grown potatoes, partly because I'm paranoid about what's sprayed on my food, partly because I'm concerned about conventional farming techniques ravaging the landscape, and also partly because they often (not always) taste a damned sight nicer. ¶ The most consistently pleasant tasting organic spuds available at a supermarket in recent years have proved to be Sainsbury's Lady Balfours (available in 2.5 kg bags for about £2.70). When they are good, they are very good; sometimes they are no better than average.¶ But any of the supermarkets will occasionally turn up trumps and today, because Sainsbury's was a long hike away, I dropped into my local Waitrose to buy ingredients for my Ligurian pasta and pesto specialty, in which both green beans and potatoes also feature prominently. 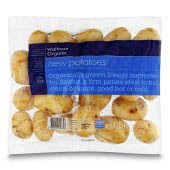 ¶ I chose a bag with blue livery, containing 1.5 kg of Waitrose organic new potatoes (£1.99). I put them in the steamer and, when they were cooked, took one out, sliced it, let it cool and treated myself by dipping it into the Tesco's pesto which I'd also bought. It was a revelation. A lovely sweet, rich, buttery potato. 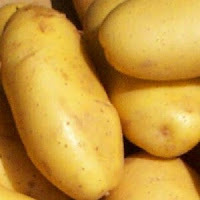 With a nice yellow colour, too (my Dad always revered yellow spuds as more tasty than their white brethren). ¶ Now, as a natural product, potatoes can and will vary from batch to batch (hence the inevitable inconsistency with the otherwise admirable Lady Balfours) so if you are going to get the same wonderful potatoes on your plate you need to get the same batch and type. The ones I bought are marked "Nicola" for the variety, "Cambs UK" for their origin. They are dated "Display Until 22 October" and "Best Before 25 October". They also feature these cryptic markings: PP1 11:00 236/M. ¶ Now you know! Happy hunting. Or digging. Like the Anyas (think that's how you spell it) from Sainsbury's too. Very tasty.